Saturday 25th July. 6 pm. Oxford Circus. The streets are as busy as they could be. Shoppers, tourists are everywhere. I drop in H&M just in front of Oxford Circus station. There is a Drum set at the entrance with some guy with long hair setting it up. Interesting! I look through some clothes, try some hats, and flick through some dresses for my brother’s wedding. A sharp noise suddenly invades the building. My slow brain thinks it is a Fire Alarm. I look around. Oh. 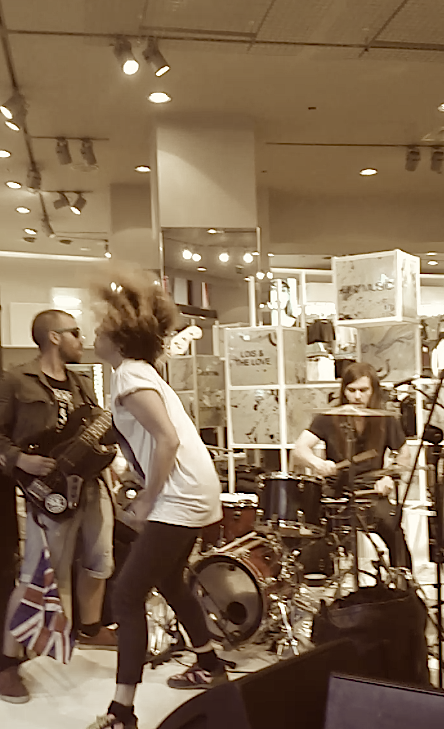 It is a band called Lois & the Love sound checking in the middle of H&M. I never liked shopping anyway, a good excuse to run away from the dresses and stand in front of the band, where a few curious people have gathered. “Hello, London” the lead singer says with a smile. 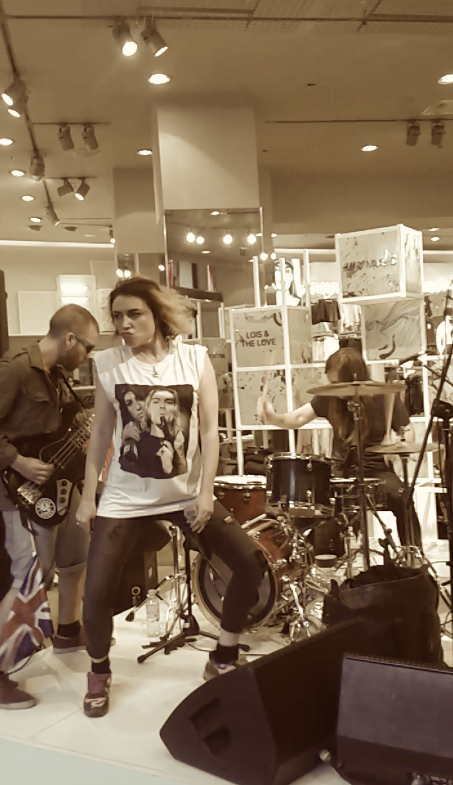 Short-ish died blond hair, she is wearing a Kurt Cobain/Amy Winehouse t-shirt and is surrounded by the drummer with the long hair, a well-built tattooed guitarist and a bassist with a union flag attached to his bass guitar. And suddenly, the lame pop dance music so typical to fashion shops is replaced by some energetic, glamrock feat punk feat grunge rock’n’roll music. T-Rex, The Clash, Nirvana or even Little Richard would have been extremely pleased to shop in H&M that day. Out of nowhere, the singer, called Lois, hits high notes then low notes, as if it is as easy as breathing. She sings like she is possessed, with footwork reminiscent of a boxer, a dancer. Some people just got it on stage, and from the word Go she owns it. All the shoppers are gathering in disbelief around the band. A wide range of little kids, happy parents, excited teenagers and young people are shaking their heads upside down, or taking videos. The music feels like a storm. The talented guitarist, bassist and drummer are running the wave, and Lois, the lead singer is surfing on it. She dedicates one of the songs to the kids in protest against the war in Afghanistan before screaming something outrageously pleasant about Fxxxxxg David Cameroun. “I don’t wanna be your love” she shouts on another one. Lois and the Love music is multi-dimensional. There is humour, darkness, power, rage, there are screams that would make Kurt Cobain jealous. Their songs can be politically engaged or about love, they can also be about wolves screams, but they always tell a story and they are delivered in a mesmerizing way. It’s almost hard to believe we’re in the middle of a shop. Security men are desperately trying to keep the crowd away from the doors of H&M. But Lois and the Love have unleashed the rock’n’roll in each kid, 40 years old parent or teenager. The security men had to give up. A 70 + crowd have gathered outside H&M to watch the concert and some people have started loosing control, with a particularly good dancer stretching and dancing on the front row of the stage. The concert ended on a bang, with Lois singing “I am the song of God” to a theatrical, irresistible, spiritual guitar/base/drum line. All the ingredients of the music are so well blinded together. It feels like without the Love, there is no Lois and without Lois, there is no Love. This band can do great things. Like Muse, Alabama Shakes, they are natural performers, but in a crazier, wilder, more eccentric way.If Lois and the Love go one day on a main stage in Glastonbury, Hyde Park, Field Day, Roundhouse, HMV Forum Brixton (or anywhere else), they will make a huge impact. That’s all what music needs at the moment. Debut album is out in August. Listen to: War, Denial, Carpet Burns, Rabbit Hole.